Download the 2018 Lenten Brochure. What a wonderful time of the year to step back and take stock of our lives. Some people do this on New Year’s Day and make resolutions that usually last only a few weeks and they are rarely spiritual in nature. 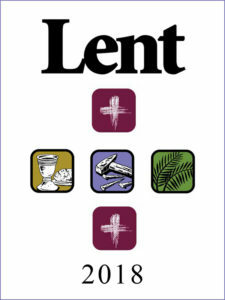 As Catholics the practice of Lent has been a part of our lives, for most of us, since childhood. It is in our bones, it is part of our identity. Lent is a time of grace when we strive to deepen our relationship to Christ and to grow in holiness, drawing closer to God by our thoughts, words and actions. What positive steps are you going to take during Lent to improve your relationship with God, with others and yourself? Consider doing something positive each day and at the end of each day take a few minutes to reflect. You might even consider keeping a spiritual diary to keep track of your own spiritual growth throughout Lent. Simply writing down each night a positive thing you did that made the day more sacred? What will the next 40 days of Lent bring? Will it be a time of grace, a time of spiritual growth? 40 days from now, what will you be celebrating on Easter? This brochure offers a number of opportunities for you to consider as you walk step-by-step along your journey from Ash Wednesday to Easter Sunday.